The traditional approach to buying electricity has simply been to see it as any other purchase: businesses would try to secure a good price and good terms, but there was little or no thought given to energy as a strategic issue, despite its importance to many businesses. But the traditional approach to buying electricity almost guarantees locking in much higher electricity costs than can be achieved with the more modern, innovative and sophisticated methods we examine in the new book Power Profits. In Chapter 2 of the book, we examine the eight most common mistakes when purchasing electricity. not having an energy strategy. Let’s have a look at each of these important issues. Electricity retailers can often do a great job in achieving customer loyalty. Taking customers to dinner and drinking great wine, feting them in corporate boxes to watch the cricket or football, or taking them out to shows. They build up a good relationship with their customers, as they should, and often become genuine friends. It’s good customer relationship management. Then, when the current supply agreement term comes to an end, the retailer emails a new term sheet and the customer simply agrees to the new prices, even though there might be a large increase. The relationship between the responsible manager or business owner and the retailer is so strong that there is no thought of looking at the alternatives. The wining and dining can be great, and I myself have enjoyed sipping Grange Hermitage at some of the finest restaurants in Australia and great hospitality in corporate boxes at major sporting events. However, it may be that the difference between the new rates and other alternatives is hundreds of thousands of dollars, or even millions. That’s enough to make your Grange taste cork tainted. Unless you are ambivalent to the profit your business makes or you are an owner of the business and simply like dealing with your retail contract account manager, you should always, always go out to the market for pricing offers well prior to your contract term coming to an end. There are often better deals out there, or simply the threat of leaving may get you a better price with your existing supplier. Even if you have a great personal relationship with them, don’t let your account manager take you – and your business – for granted. Wholesale market half-hour pool prices, or spot prices, vary throughout the year, and from year to year. Prices are often high in summer and in the depths of winter. Retail prices have a correlation with spot prices, and so when spot prices go up, retail price offers often follow. If there is a significant market event such as a supply disruption, extreme weather, drought, or a power station closure announcement, that will push spot prices up and retail prices will often follow. It’s important to understand what is going on in the market prior to putting out requests for proposals for retail supply offers. If you don’t, you may well be locking in prices at the top of the market. This is an area that an energy consultant can help you with. They should know what is happening in the market and be able to advise you about when would be a good time to seek supply proposals. However, it’s better if you know what is happening in the market yourself and have your own view as to whether prices are likely to settle down or if there is a real risk of them continuing to go higher. Be aware, though, that the retailer will always have better knowledge than you. It pays to be well informed, but you can never have as much information as those on the other side of the fence. Energy consultants can save you hundreds of thousands – if not millions – of dollars a year. However, they could also be delivering you zero in value if you have chosen the wrong person or are not using them wisely. A mistake that some businesses make is to engage a consultant to run an electricity tender or requests for proposals every three years and then not see them in between. You do not need to pay an energy consultant to run a tender process for you. If you employ an energy procurement manager and they engage an energy consultant to run the process then you do not need the energy procurement manager. Consultant gets company to sign a letter authorising them to request load data from the retailer or network provider. Consultant sends off email requesting data. Consultant receives email with profile data. Consultant sends email with load data off to the contacts that he/she has at half a dozen retailers. Retailers send offers to consultant. Consultant plays the argy bargy game with retailers to trim down margins a little. Consultant puts the figures in a spreadsheet and compares offers. Consultant sends spreadsheet along with formal offers to the client, including a recommendation and demonstrating how he/she pushed the retailers to achieve lower prices. Consultant invoices client for $10,000. Client accepts recommendation, argues terms and conditions with retailer, and signs offer. Client, consultant and retailer go to best restaurant in town to celebrate deal and enjoy a bottle of Grange. 5 years later, consultant calls client to let them know that supply contract is up for renewal. Does that seem like the consultant has added much value to the process? If you know nothing about energy, or if energy is just one of the many categories you are managing, or if you are new to energy procurement, using an experienced energy consultant can be invaluable to help you learn. But as you learn, you should be able to understand what is happening in the market yourself and develop the industry contacts to make direct approaches for requests for proposals. However, a good energy consultant does much more than just shuffle papers and figures for you. A good energy consultant provides you with timely information about what’s happening in the market, analyses your load profile to identify opportunities for savings, gets to know your business and your operations, provides monthly reporting on your energy cost performance, helps you to develop an overarching energy strategy, and supports you to continue to drive energy costs down year on year. A good energy consultant saves you money; they do not cost you money. If electricity is a significant cost for your business then you should have a good understanding of what’s happening in the electricity market. A common mistake made by many energy users is to not understand the market and then be surprised by sudden and rapid price increases. In a similar way that you need to understand your sales drivers, revenue drivers, labour cost drivers and the cost of your raw materials, you need to understand the cost drivers of your energy bills. Understanding how the markets operate, the ever-changing dynamics of the markets, and the opportunities to exploit the markets to your own advantage is key to reducing energy costs. For example, the 2016–17 retail price increases were completely foreseeable. Wholesale prices always flow through to fixed retail prices. Anything that affects the wholesale market – such as coal-fired power station closures, increasing gas prices, droughts, new generation investment, growth in wind and solar generation – eventually shows up in the fixed retail price offers. If you don’t understand what’s driving the market, you would not have seen these price increases coming and would have been caught paying too much for your electricity. It’s also beneficial for the whole business community if energy users are informed and engaged. Governments have a limited understanding of how market dynamics and market imperfections are playing out specifically for consumers. They understand issues with supply dynamics and market efficiency, and know that customers are complaining about costs going up, but they are used to – and to some extent immune to – businesses complaining about the increasing cost of doing business. They are, however, very interested in informed input from knowledgeable end users. It’s critical that small, medium and large end users understand the market and collectively lobby for reforms that support market-driven downward pressure on prices. There are two major energy user representative groups: Major Energy Users Incorporated (MEU) and the Energy Users Association of Australia (EUAA). It’s important to be a member of one or both of these organisations to keep abreast of market reform issues and to give them strength to lobby for reform on your behalf on issues that are affecting your business. Many consumers believe that the only way to buy electricity is from a retailer at fixed prices. This is a common but fundamental mistake. Retailers package up an electricity supply offer to a customer that guarantees the retailer a margin with minimal – if any – risk. The underlying electricity spot market price fluctuates, and that risk is measured by the volatility of prices. In order to reduce the cost “risk”, customers are paying retailers a substantial risk premium without realising it. It is true that retailers can minimise their risk by taking a portfolio approach across a large range of customers, and the consumer benefits from that. But the consumer is still paying a large risk premium. But there is another way. A customer can purchase their electricity at wholesale market prices and accept the risk themselves. They profit if price volatility is low, and pay more if price volatility is high. The customer can still purchase through a retailer but not pay the risk management premium that vanilla retail offers include. Some consumers take this approach and are either willing to accept the risk in return for the much larger potential cost savings, or they physically manage their risk by curtailing load when prices are high and enjoy low prices the rest of the time. Some retailers understand their customer needs and structure hybrid products that allow customers to lock in fixed rates for some of their essential load and market spot prices for the remainder of their load. This enables the user to fix a price for the load that it would not be prepared to curtail in the event of high prices and allows the remaining load to be flexible to run depending on the current market price. It is not necessary to buy electricity at fixed retail prices. There are other alternatives that provide greater potential savings for a manageable risk. Believe it or not, most businesses do not really understand their own electricity use profile. That’s because it’s not their core business. However, understanding that profile is critical to understanding electricity cost drivers. That’s why retailers need to obtain a potential customer’s load profile before offering a price. Electricity price offers are structured around peak and off-peak prices for the energy component, but there is also a network charge component around different peak and off-peak periods. Electricity costs can be decreased significantly just by shifting load to different periods or by avoiding certain periods. Most businesses believe that they do not have the ability to curtail or shift any load. They cannot compromise their ability to meet their customers’ demands, and they assume that requires the plant to run at capacity throughout their normal operating hours. I had one client who insisted that they had no ability, at all, to curtail load, and that their plant had to be kept at 100% of operational capacity. But when their data was analysed it was quite clear that they did curtail load throughout the day. They switched a large proportion of their load off at 10:00 am every day, and almost all of their load off at midday. They were obviously curtailing their load for morning tea and lunch breaks. I had another client who stated that they absolutely had the requirement to run past 4:00 pm to meet customer demand shortfall and they could not possibly switch to a tariff that provided much cheaper prices if they did not run past 4:00 pm. But the data revealed that they never, ever, ran past 4:30 pm, so the demand was clearly overestimated. All operations have some flexibility. Of course, the operational asset that is the plant bottleneck or constraint is usually required to run at 100% capacity, but there are almost always other loads that can be switched off if energy prices are high without impacting customer supply, quality, equipment integrity, safety or the environment. To maximise energy cost reduction opportunities you need to understand the constraints, bottlenecks and flexibility of your operations and examine how your load profile can be flexed to minimise costs. For many businesses, the energy (flowing electrons) costs often account for only 50% of the total energy bill. Even then, energy costs are driven by when that energy is used. Network costs and other supply charges can often account for up to 50% of the total costs. When you use your energy and the maximum load when you use it are the largest drivers of energy costs, and not how clever you are at negotiating a supply deal. For example, peak prices are often up to double off-peak prices. So, the scheduling of production has a huge impact on the cost of production. It may be the case that a business may have to confine their operations to peak periods due to human resource or regulatory constraints, but operating in off-peak periods at night time and weekends is much cheaper from an energy perspective than operating in peak periods. It’s not just the energy component that is cheaper. Network charges are also lower during their designated off-peak periods. Network tariffs vary between jurisdictions, but one thing that is common is that network demand charges are determined by the maximum demand of any one half-hour period over that month. In some jurisdictions, such as South Australia, the maximum demand is set on the highest demand in any one half-hour period over a historical period greater than a year. One short half-hour spike three years ago may be driving higher costs than is necessary. In some regions, the network tariff is set based on the amount of electricity that the business uses. In other regions there is some choice as to which tariff you use. Very large users can also have “negotiated” tariffs. In South Australia, there are two types of common businesses tariffs: “agreed demand” and “actual demand”. With the agreed demand tariff, the maximum demand that applies to the bill every month, irrespective of the actual demand for that month, is set at the highest half-hour demand set during previous historical peak periods (November to March, midday to 9:00 pm on working days). There is also an “additional demand” charge that is applied, which is set to the highest historical demand outside of the peak period, less the agreed demand amount. The additional demand charge rate is around half of the agreed demand rate. The peak demand charge is based on the highest half-hour demand during peak periods (November to March, 4:00 pm to 9:00 pm, work days), the shoulder demand charge is determined by the highest half-hour demand during shoulder periods (midday to 4:00 pm, work days). Off-peak demand charges are zero. Depending on your load profile, the agreed demand tariff or the actual demand tariff will result in lower costs. An operation that runs past 4:00 pm on working days is likely better off on an agreed demand tariff, whereas an operation that turns most of its load off prior to 4:00 pm will be better off on an actual demand tariff. However, from November to March, if a business on an actual demand tariff runs past 4:00 pm it will incur a substantial cost penalty. By doing a deep dive analysis on historical half-hour demand, a business can pinpoint causes of higher demand and seek to eliminate or reduce the root causes and subsequently reduce demand charges. Metering charges have also generally been thought of as fixed. Metering services are now contestable, and it’s possible to achieve substantial reductions in metering charges. You can choose your own metering agent based on competitive metering rates and not just rely on the retailer to provide this service at inflated rates. Environmental charges are also a component of your bill. Your retailer purchases renewable energy certificates on your behalf and passes those costs through to your business. At mid-2017 pricing, large-scale generation certificates (LGCs) are costing an additional $85/MWh (8.5¢/kWh) for 14.22% of the electricity that you use and small-scale technology certificates (STCs) are costing around $34/MWh (3.4¢/kWh) for 7.01% of the electricity that your business is using. Once again, there are options. You do not have to accept the default retailer pricing. purchasing electricity through a long-term offtake agreement with a renewable energy project. By understanding how the electricity tariff is structured, a business can make informed decisions on which is the best tariff for its profile, how to schedule operations to minimise charges, alternatives for metering agents, and options to reduce environmental charges. For many businesses, energy costs are in the top two or three cost inputs, up with labour. Increasing or decreasing costs will have an enormous impact on profit, yet it is not common for businesses to have a strategic energy plan to reduce long-term energy costs. Labour costs are usually the top input cost. It is quite common for there to be a comprehensive human resource strategic plan to minimise labour costs and maximise productivity. This strategy would include industrial agreements, training and development, recruitment and retention, rewards and recognition, performance reviews and succession planning. It’s difficult to put a dollar value on the benefits of this strategy as they are largely intangible. However, we all know that it’s extremely important to have a human resource strategic plan or set of strategies. It is also very common to have sales and marketing strategic plans to help increase revenue, and it’s quite common to have an overall business strategic plan that usually involves increasing sales and reducing costs. It is less common to deal with energy use and procurement at a strategic level. If you wish to significantly reduce energy costs, you must have a strategic energy plan to guide you and ensure alignment and accountability throughout the organisation, and to lift the level of decision making. 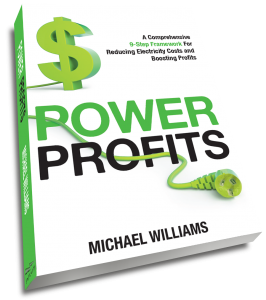 The book Power Profits addresses each of these common mistakes and guides you to alternatives that will help you reduce costs and increase profits. It provides a comprehensive 9-step framework for reducing electricity costs and boosting your profits. If you would like to learn more, check out the book here, available in hard copy or as a Kindle Ebook.